This is our first model created by a student in our school to print on our Makerbot! This gun started as a high-resolution modelling assignment in 3D Studio. Andrew designed, modelled and cut up the gun so it could be printed in our Makerbot. 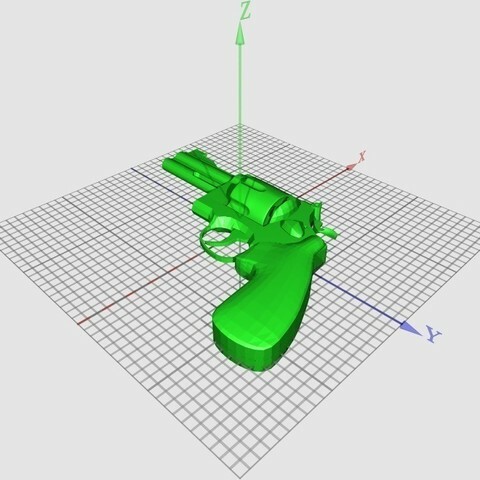 1) Print all the pieces (Revolver_full is just to see the competed mesh). We used silver for all parts except the grips and the sights, which were black. I used a raft for the smallparts, the sights and the barrel; everything else printed just fine without it. 2) To make the barrel able to spin, we inserted a small piece of filament through the centre hole and into the small indends in the lefthalf. You may have to widen the center hole of the barrel with a small drillbit. I also carved out these 2 indents a bit for the filament to fit. 3) Insert the barrel and glue the lefthalf to the righthalf (place a bit of glue on the filament inserted into the lefthalf). 4) Cut off support pieces on each grip. 5) Glue grips together. Then glue them onto the gun. 6) Glue trigger, hammer, and sights into place. That's it, have fun. Warning!! This looks a lot like a real gun, be careful.